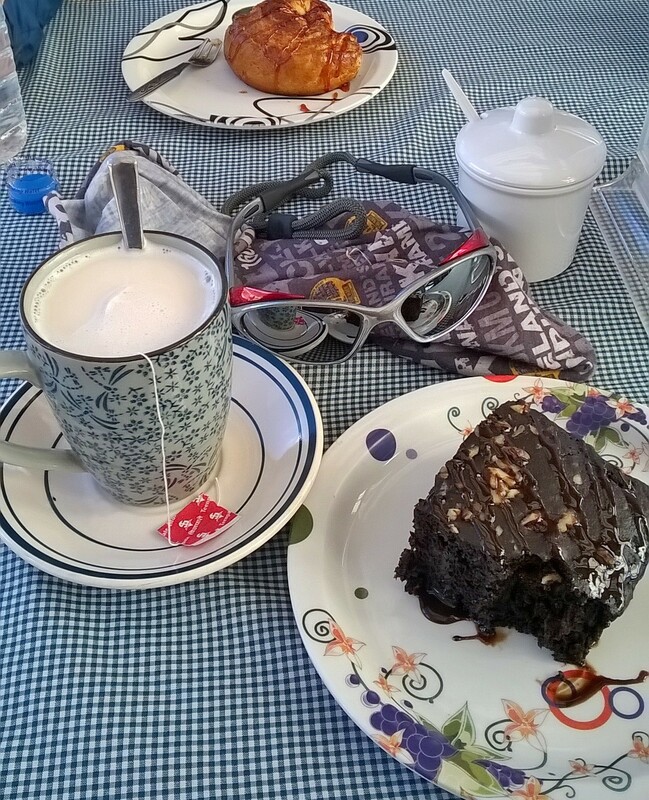 Well how did my trek to Everest base camp come about? 3 Years ago I set a personal goal to be at Base camp on the 22nd October 2015 so checking out trekking guides, I came across Ian Taylor trekking. 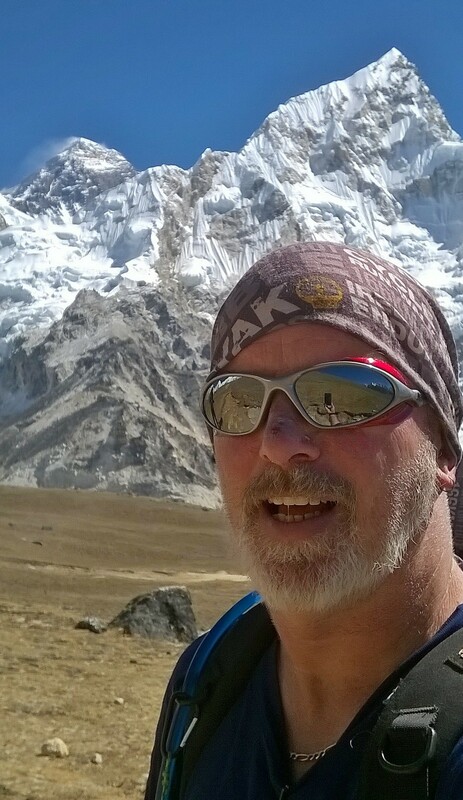 Ian was the youngest Irish man to summit Everest in 2008. So he should know what he’s doing. 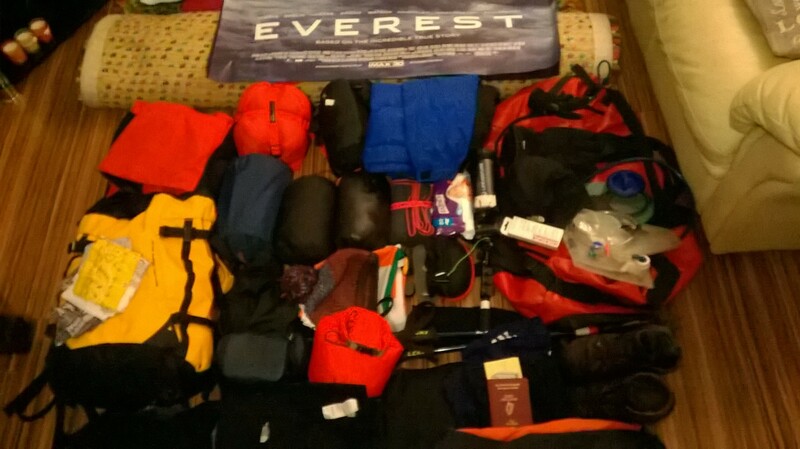 I contacted Ian and told him my goal, to camp at EBC on the 21st October 2015,” No problem John I’ll put it on my web site and we can start the ball rolling,” he said. 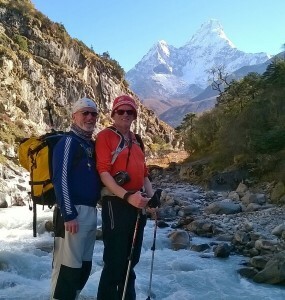 Everything was going great then the terrible earthquake in April 2015 and people started getting worried and pulled out of my trek, so when I arrived at Kathmandu on the 10th of October this year I found out it was going to be me and one other, Kenn. Kenn was from Calgary, Alberta in Canada, a gentleman. From the moment I arrived outside the airport, I was greeted by Pasang Sherpa Lama, who was to be my guide for our trek to EBC. After being giving a tour of Kathmandu by big Dawa and meeting his wife Kay (lovely women) we went out for dinner then went back to the hotel and prepped for our early flights to Lukla. At Lukla we meet up with Kancer Rei our porter and started our trek towards EBC. Monjo was the first overnight stay and the first experience of Nepalese lodges. You have to remember what you sign up for and where you are then you realise that they are pretty good. Some trekkers would use their sleeping bags even with duvets being supplied, I used a sleeping bag liner for the lodges and found it grand. The food in the lodges was great with a great choice of local and European dishes, my favourite meal was the “Chicken Sizzler” I would recommend it. 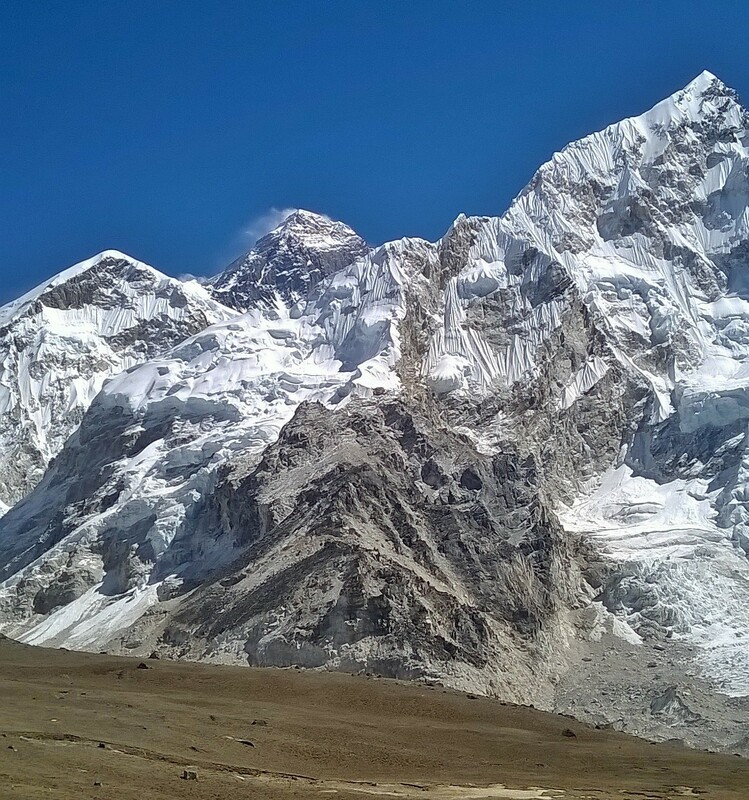 From Monjo we trekked to Namche, the walking pace was so relaxed it made it easy to take in the whole experience. Namche is a 3 day acclimatisation stop with a day walk to Khumjung village where Hillary built his first school for the locals and a visit to a monastery and another day up to visit the Tenzing Norgay stupa and visitors centre nice easy days but necessary to help with the altitude as you progress towards base camp. From Tengbouche to Dingbouche is a trek of some major up’s and downs and I mean from river to hill but with blue skies and warm weather it was just perfect, now when the sun left the valley floor then it got cold but bearable. Dingbouche was a 2 day stop which included a trek up to a ridge were we spent a few hours but with a beautiful view it was just perfect. 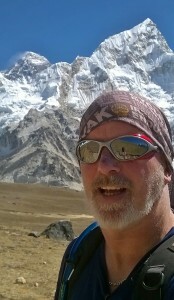 Dingbouche to Lobuche then onto Gorek Shep the last stop before Everest base camp. 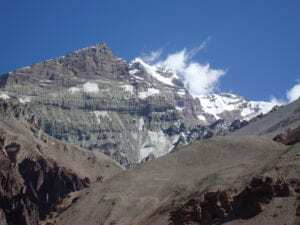 Lobuche to Gorak Shep is about a 3 hour trek but when we arrived it was only 11.15am so we decided to go up Kala Pathar which at a height of 5,545m will give us the perfect view of Everest. It was the first time I felt the altitude but with the nice slow pace we all seemed to manage the trek and it was so worth it. 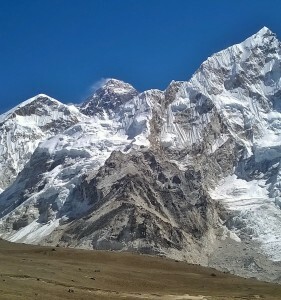 So the next day we left Gorek Shep and followed the Khumbu Glacier to set up tents at Everest base camp, what a feeling when you arrive at the official prayer flags at EBC, the sense of achievement of being at the base of every mountaineer’s meca “Everest” That evening we shared noodles and soup with a cup of tea. The sounds in and around base camp that night were amazing, you would hear maybe a small avalanche miles away or the cracking of the glacier. 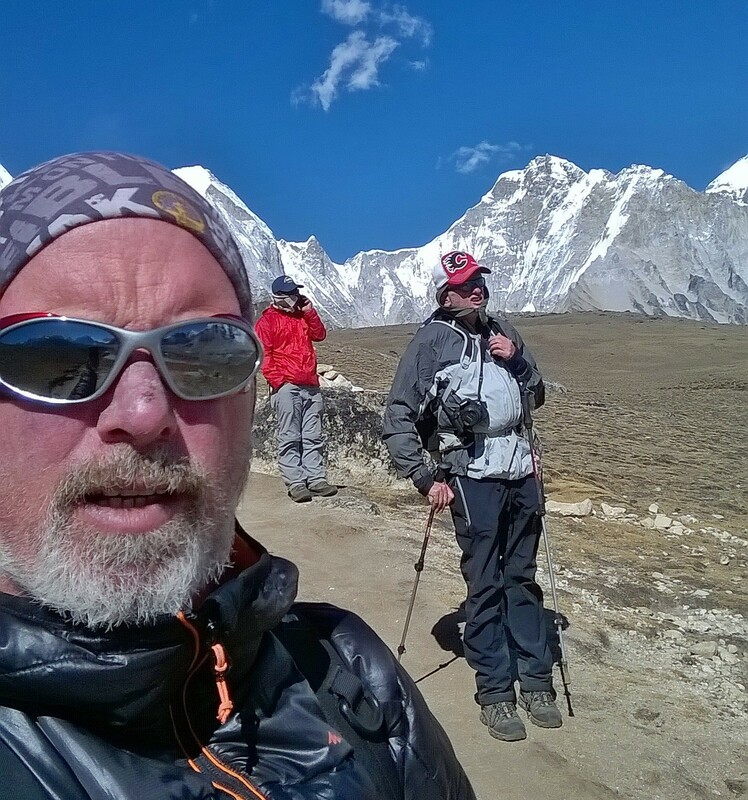 I woke that morning the 22nd October 2015, Pasang and Kancer Rie had cards and presents and with Kenn my new friend and trekking buddy we celebrated my 50th birthday. Sleeping at Everest Base Camp was my goal and my dream had came true. What takes you 10 days trekking up to EBC, only takes 3 days to descend back down the trek but you find that your energy level increase. Pasang our guide and Kancer rie our porter did everything for us they took all the hard work out of the trek, they were brilliant. The local people are great and very welcoming. 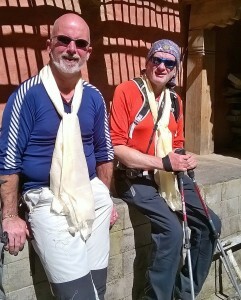 With the last day spent exploring Kathmandu it was a trip of a lifetime. My advice for a trek like this is listen to the people who have done it before, remember your paying for an experience of a life time so if you try and bluff yourself about your fitness and you do little or no training then a trek like this becomes difficult. Increase your fitness just a bit it makes it more enjoyable. 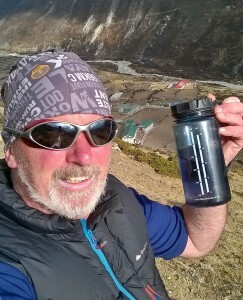 The hardest thing I personally found to do, was drink 3 to 5 litres of water every day to stop dehydration and if you don’t it will stop you finishing your trek. Be aware of the wind, if the wind picks up then cover up the ears and head and use a buff. If you would like to sleep in Everest base camp in 2016. Get in touch with the Ian Taylor Trekking team. We have the staff, proper acclimatization, unique itinerary, training plans and quality service throughout. We use the best lodges with the best food. CONTACT US and find out more.